An 83-member Bangladeshi youth delegation arrived Yunnan on Monday to attend Bangladesh-China Youth Camp as part of the ongoing efforts to strengthen people to people contact and cultural ties between the two countries. Another group comprising around 70 participants will be departing on Tuesday to join others. "Together it's a 150-member delegation," a Chinese Embassy official accompanying the first group told UNB. Bangladesh and China have dedicated 2017 as the Year of Friendship and Exchanges between the two countries when Chinese President Xi Jinping paid a state visit to Bangladesh in October14-15, 2016 seeking a promising future. "I am excited to be here. We will be able to share our experience with our Chinese friends. We will explore ways to strengthen friendship with China through building bridges between Bangladesh and Chinese youths," Intishar Karim, a member of Bangladesh youth delegation, told UNB upon his arrival in beautiful Yunnan. Syeda Fabiha Islam, a student of Independent University, Bangladesh (IUB) said, "Bangladesh and China are good and old friends. It's an opportunity for us to know more about China and build friendship with Chinese youths and strengthen people to people contact." Sabrina Nuzhat, another youth delegation member said she is visiting Yunnan for the first time. "In fact, this is my first trip abroad. I am extremely happy to be here. Over the next two weeks we will highlight Bangladesh and explore ways to widen our friendship with our Chinese counterparts," Sabrina said. Earlier, an orientation programme for the participating students was held at the Chinese Embassy in the city to give an idea about the Youth Camp. Chinese Ambassador in Dhaka Ma Mingqiang and Dhaka University Vice Chancellor Prof Dr AAMS Arefin Siddique, among others, spoke on the occasion highlighting growing relations between Bangladesh and China and building bridges of friendships between youths. The Chinese government, earlier, chalked out yearlong events in Bangladesh and China to mark the Year of Friendship and Exchanges, including high-level visits, fairs, cultural events, to further strengthen the bilateral relations. Bangladesh and China signed 27 deals worth about $24.45 billion in soft loan for various key development projects apart from signing of 13 joint venture agreements involving $13.6 billion of Chinese investment in Bangladesh last year. 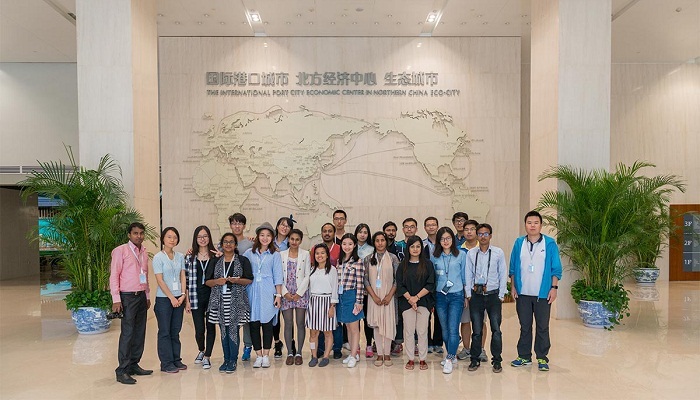 The 150-member student delegation from Bangladesh will pay a two-week extensive visit to Yunnan Province under the China-Bangladesh Youth Exchange Programme. China will train 500 Chinese-language teachers for Bangladesh, 100 Bangladeshi cultural professionals, and invite 600 Bangladeshi students to visit China during 2016 to 2020. This is the first such student delegation from Bangladesh to China. Members of the delegation, drawn from various educational institutions, including Dhaka University, North South University and other universities, colleges and schools from different parts of the country, will visit prominent cultural and historical sites, top educational institutions across Yunnan Province and are expected to call on the prominent figures there. DU VC appreciated the initiative of the Chinese government to arrange such visit by young students who will ultimately be the bridge of China-Bangladesh ties. He highlighted the Chinese development and historical backgrounds of Bangladesh-China relations and the cooperation between the Dhaka University and Yunnan University. Ambassador Ma said during the visit of Chinese President Xi Jinping, the two sides announced the year 2017 as the "Year of Friendship and Exchanges" between China and Bangladesh and termed youths of the two countries as future leaders. The two countries also agreed to expand exchanges and cooperation in culture, education, tourism and other fields, and to promote interactions between the media, think tanks, youth, women organizations, non-governmental groups and local authorities of the two countries.